Trying to be more social, I joined a Meetup group for a photoshoot and socializing event in Liberty Hill Texas. Liberty Hill is a small town not far from where I live. There is a little downtown area where we met and explored different things to shoot. 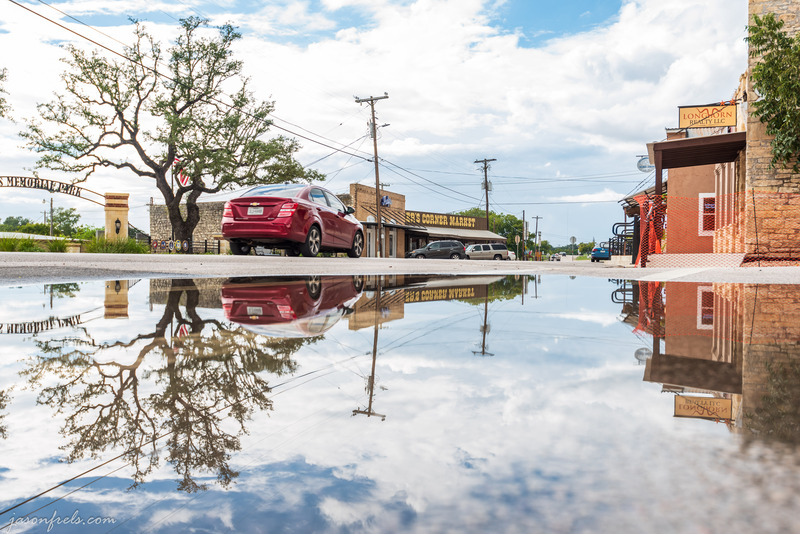 With the above I was capturing an establishing shot of where I was (in Liberty Hill). 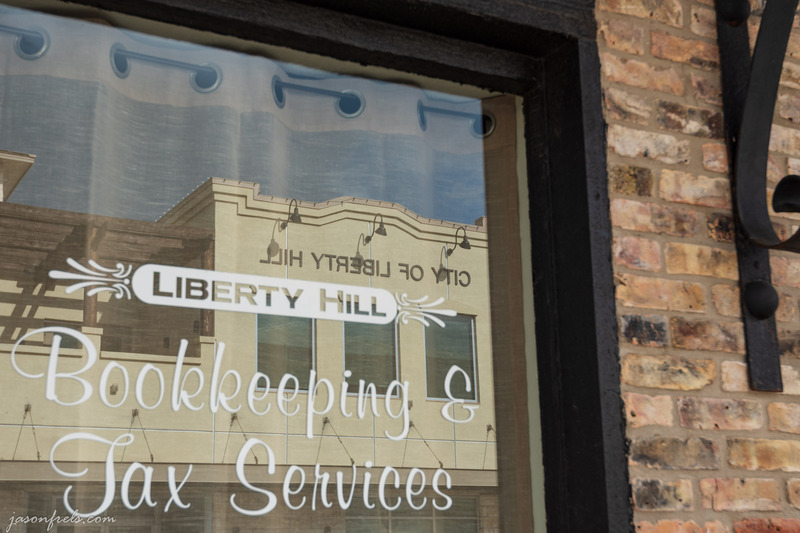 I found that I could get a good reflection of city hall in this window of a local business. There was a lot of sun on the city hall and I like having “Liberty Hill” clearly on the window plus the reflection mirroring that in the background. 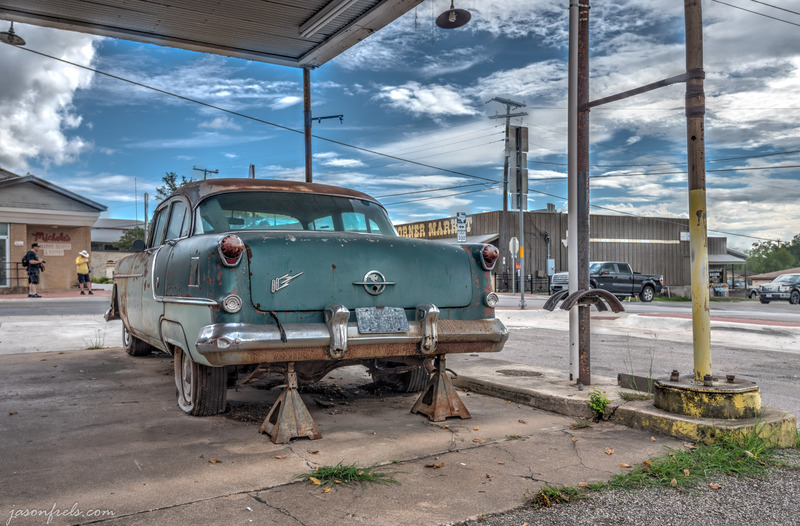 I drive through this area quite often and I have noticed this old car near a rusty shop on the main street through town. Many of us naturally gravitated toward this old car for photos. 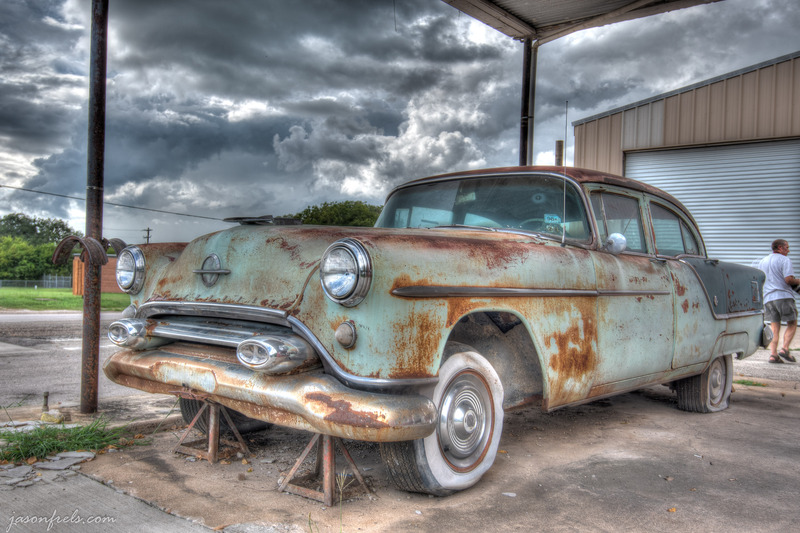 This is an old Oldsmobile, it’s up on jack-stands, has rotten old wide white wall tires and seemed to be begging for an HDR treatment to me. The amazing clouds in the background were a bonus. There were a lot of people walking around and it was hard to get people out of my shot. So, there is a person in the background that didn’t ghost out well. I thought about fighting with this in Photoshop, but I decided that I didn’t want to do all that work and settled for the photo as it is. I did quite an exaggerated HDR merge on the above photo because of the clouds in the background providing a lot of drama. I also went around to the back of the car and from this vantage point there is a lot of blue sky in the background; see the photo below. I gave this photo a lot more of a realistic merge, but I still got a lot of color out of the car which was in shadow. I also like the look of the weeds growing in the cracks and the rusty poles and old light fixture in the shot. To take these shots, I didn’t set up with a tripod or carefully change exposures in manual mode. Rather I set the camera to take five brackets at -2, -1, 0, +1, +2 EV, I then framed it and hit the shutter button 5 times. Photomatix Pro aligns the images and they turned out well enough. I did flip through the photos on the back of the camera to make sure I had some dark and bright exposures. I also came across a large rain puddle that I tried to figure out what to do with; see the picture below. The power lines and their reflections really put some visual perspective in the picture. I waited until various cars had moved through the scene to provide a sense of motion. I like the way the red Chevy worked out just past the tree but not blocking the store in the distance. I really like the symmetry in this photo. This photo is exposed for the high bright clouds and that really overloaded everything else. I did work to bring the cars and buildings up a bit to make this work. To take this photo, I stepped out to a small dry place in the middle of the puddle, selected live view, squatted down and got the camera almost on the ground. I took several photos timing different cars as the passed by as I wasn’t totally sure what I wanted yet. This is probably my favorite shot of the day. We later went to a Mexican restaurant, had drinks and food and chatted. I usually don’t do well with strangers, but I wanted to force myself to get out there and be a bit social and I had a good time. Thanks for reading and leave a comment if you like. I do really like that last shot as well!